The history of Santorini is the history of a volcano. Contrasting layers of pumice-stone and santorinean soil, bear witness to the eruption of the volcano, which took place some 3500 years ago, cause three quarters of the island to sink into the sea. 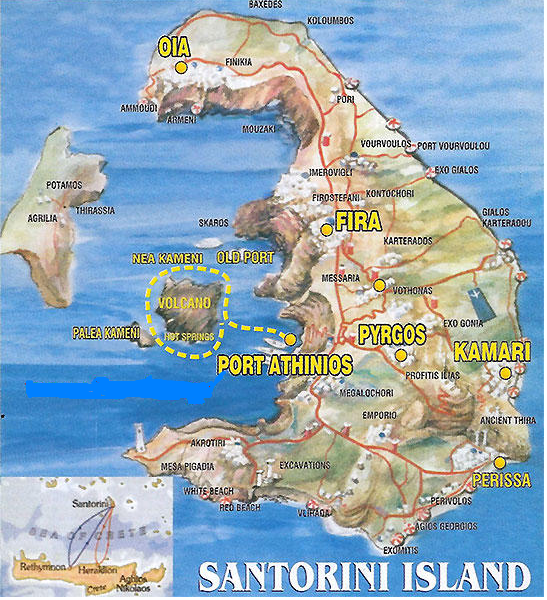 The vivid marks this enormous catastrophe, in connection with the ruins of a highly advanced civilization, remnants of which were recently found at Akrotiri, have lead many to believe that Santorini is the legendary lost Atlantis. 15.30 KAMARI: The most popular beach in Santorini which is know for its black sand and crystal clear water. For your lunch will be a real pleasure to discover traditional taverns with Greek specialities such as "Fava" and fresh fish served with excellent local wine. Volcano: Besides, you will have the chance to participate in the tour of the volcano round trip and Hot Springs swimming by comfortable and traditional Egiopelagitika small ships. During the route, there will be some stops for taking pictures etc. Children 0-4 free of charge (no separate seat and not for Business Class). Children 4-10 - 50% reduction on the regular price.